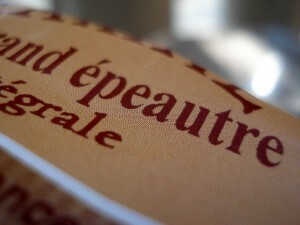 Not too long ago, I bought a bag of organic spelt flour (farine d’épeautre) at a nearby health-food store. This wasn’t the first time I’d ventured into the more “unusual” flour section of the store. I’d had my eyes on this particular flour for a while, but it wasn’t until recently that I decided to actually purchase some. Since moving to France, I’ve also wanted to learn to make quiche crust. So, with my flour in one hand and a plethora of memories (and advice) from my mom’s kitchen in the other, I set out to make my first spelt quiche crust. Why give spelt flour a try? It’s not only easier to digest than conventional wheat flour, it’s high in protein and has a pleasant, slightly nutty taste. Note 1: In general, you should use less liquid when cooking with spelt flour. Note 2: Do NOT overwork the dough! That’s my mom’s secret to keeping it light and airy. Note 3: Instead of rolling this dough out, I pressed it directly into the quiche mold. This also helped it stay light and kept the dough (spelt has a crackly texture) from falling apart while rolling and transferring. 1. Combine flours in a mixing bowl. 2. Cut butter into flour (small cubes) and mix with fingers (no using any utensils!) until the butter has taken the shape of very small rounds and is well-mixed with the flour. 3. Add a few spoonfuls of milk, less rather than more, and pat dough together with your palms. This is where you have to be careful not to overwork the dough- five hand-movements to fold it all together is perfect. If you have the right amount of liquid, it should all come together in a (not-so-smooth) mound of dough. 4. Line quiche mold with wax paper and press dough directly into it. 5. Poke the bottom and sides with a fork to avoid air bubbles. Uncooked, it’s ready for your favorite filling. This entry was posted in Recipes (All) and tagged mains. Bookmark the permalink. Guess what-I made your spelt crust for my blueberry pie last night. So good. Thanks for your recipe. Hi, this is just to thank you for this recipe! I made this crust and as you said it was so light and airy. My boyfriend loved it. I will make the crust from now on always using your recipe. Thanks for sharing! Best of luck. Why do you need to add AP flour to this? When I first made this crust, I wasn’t sure if it would hold together with just spelt flour. Since then, I’ve been using 100% spelt in my other recipes, so I’m betting you could do the same with this crust. Let me know if anyone tries it.